On the way exploring the upland Sapa, this is one of the best recommendations for your trip. Y Linh Ho village, a part of San Sa Ho commune, Sa Pa is a small but interesting village, especially for travelling and visiting. 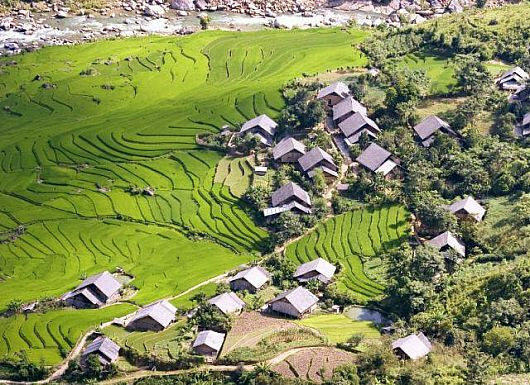 From 7km distance of Sapa town, on the way to Lao Chai village, you can contemplate the superb panorama of this picturesque village. It said that the name “Y Linh Ho” referred from an old story of the Dao that it was originated from the name of the initial explorer of the land – “Ly Linh Ho” and then though the Dao moved on to other land and it became the Mong’s residence, it has been called “Y Linh Ho” – a phonetic form – as a kind of the ancient recall. Distant from the main road, the path to the village is winding, tortuous and sloping, so Y Linh Ho is not noisy with crazy transport like in the center zone but being peaceful and quiet. The people here only depend on agricultural cultivation for living, mainly growing rice and corn, then terraces in the village are large and fascinating despite in summer when the green covering all the fields or in late autumn at which the terraces are all silky golden like an arty picture. This is also a place for best homestay to explore the lifestyle and culture, customs of the resident. It is definitely a must. 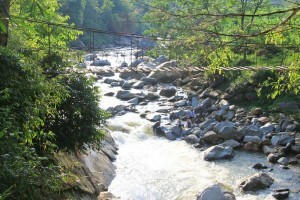 The destination is also famous for the dreamy and fascinating Muong Hoa Stream, beautiful houses of the Mong, and the hospitability and friendliness of the resident of the land. Coming to the village, you shall have a chance to learn and explore about traditional customs and culture of the Black Mong who usually wear dark clothing like in black or navy. Tourists to Y Linh Ho will meet the Black Mong’s routines such as weaving, dyeing with their unique method by using indigo. Though Y Linh Ho village is just a small commune with some small hamlets scattering on the tough halfway of high and steep mountains, Y Linh Ho is an attractive destination for tourists, particularly for whom love trekking and adventuring. With its rudimentary but beautiful houses, steep hillsides, the splendid rice terraces and the dreamy Muong Hoa Stream, travelling to Y Linh Ho is a must on your trip to Sapa. – Attractions: Muong Hoa Stream, rice terraces, image of wood-made houses, weaving and dyeing methods, winding paths along hillsides.